TC - Is there 1.5-million-year-old ice near Dome C, Antarctica? Abstract. Ice sheets provide exceptional archives of past changes in polar climate, regional environment and global atmospheric composition. The oldest dated deep ice core drilled in Antarctica has been retrieved at EPICA Dome C (EDC), reaching ∼800000 years. Obtaining an older paleoclimatic record from Antarctica is one of the greatest challenges of the ice core community. 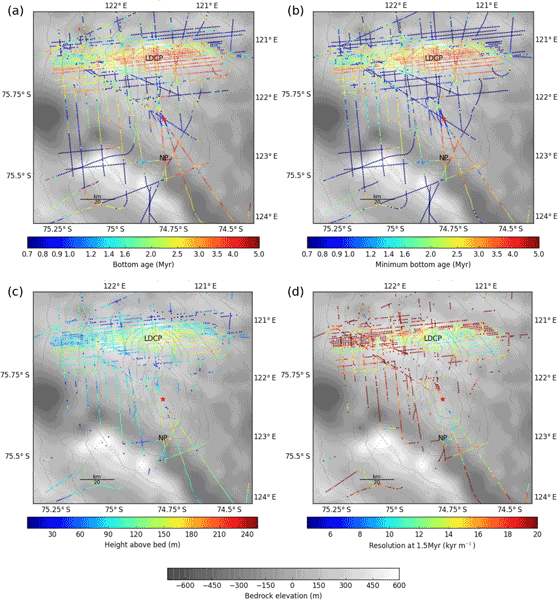 Here, we use internal isochrones, identified from airborne radar coupled to ice-flow modelling to estimate the age of basal ice along transects in the Dome C area. Three glaciological properties are inferred from isochrones: surface accumulation rate, geothermal flux and the exponent of the Lliboutry velocity profile. We find that old ice (>1.5Myr, 1.5 million years) likely exists in two regions: one ∼40km south-west of Dome C along the ice divide to Vostok, close to a secondary dome that we name Little Dome C (LDC), and a second region named North Patch (NP) located 10–30km north-east of Dome C, in a region where the geothermal flux is apparently relatively low. 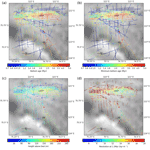 Our work demonstrates the value of combining radar observations with ice flow modelling to accurately represent the true nature of ice flow, and understand the formation of ice-sheet architecture, in the centre of large ice sheets. How to cite: Parrenin, F., Cavitte, M. G. P., Blankenship, D. D., Chappellaz, J., Fischer, H., Gagliardini, O., Masson-Delmotte, V., Passalacqua, O., Ritz, C., Roberts, J., Siegert, M. J., and Young, D. A.: Is there 1.5-million-year-old ice near Dome C, Antarctica?, The Cryosphere, 11, 2427-2437, https://doi.org/10.5194/tc-11-2427-2017, 2017. The oldest dated deep ice core drilled in Antarctica has been retrieved at EPICA Dome C (EDC), reaching ~ 800 000 years. Obtaining an older palaeoclimatic record from Antarctica is one of the greatest challenges of the ice core community. Here, we estimate the age of basal ice in the Dome C area. We find that old ice (> 1.5 Myr) likely exists in two regions a few tens of kilometres away from EDC: Little Dome C Patch and North Patch .